You can use Bluetooth functionalities in your application to, for example, manage the local Bluetooth adapter, and bond with and exchange data between Bluetooth-enabled devices. The Bluetooth standard provides a peer-to-peer (P2P) data exchange functionality over short distance between compliant devices. The Tizen.Network.Bluetooth.BluetoothAdapter class provides methods for setting up Bluetooth and discovering other devices. The class is used to control the Bluetooth adapter: you must enable the adapter before any other Bluetooth actions, and when you no longer need it, disable it to save device power. You can check and monitor the adapter state. The Tizen.Network.Bluetooth.BluetoothDevice class provides methods for managing bonds with other devices and searching for supported services. The class is used to handle the connection with other devices and to search for services available on remote devices. You can create a bond with another device with the Tizen.Network.Bluetooth.BluetoothDevice class. Bonding allows the 2 devices to establish a connection. The Tizen.Network.Bluetooth.BluetoothAdapter class provides methods for managing connections to other devices and exchanging data. The class is used for exchanging data between 2 Bluetooth devices, where your device can have the role both of a server (service provider) and client (service user). The connection creation process depends on the role. After the connection is established, the processes for exchanging data and disconnecting are the same for both roles. When you attempt to open a connection to another device, a Service Discovery Protocol (SDP) look-up is performed on the device, and the protocol and channel to be used for the connection are determined. 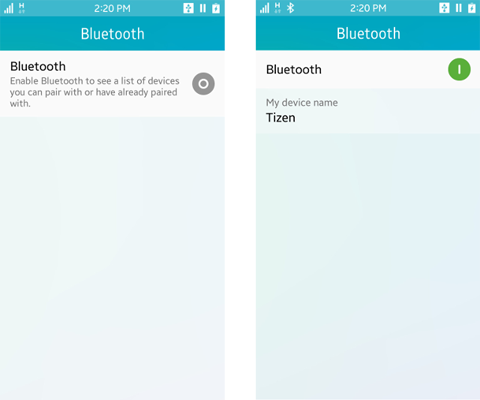 If a connection is established and the socket is opened successfully, the Connected value of the Tizen.Network.Bluetooth.BluetoothSocketState enumerator is returned in the ConnectionStateChanged event of the Tizen.Network.Bluetooth.IBluetoothClientSocket interface. The socket is subsequently used for exchanging data between the connected devices. 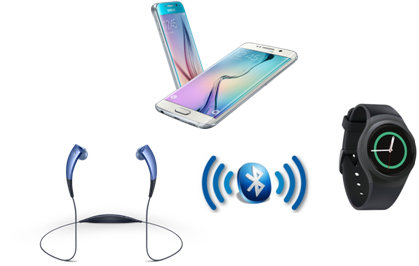 Connect to Bluetooth audio devices, such as headsets, hands-free devices, and headphones, using the Tizen.Network.Bluetooth.BluetoothAudio class. The Bluetooth GATT-related classes, such as Tizen.Network.Bluetooth.BluetoothGattClient, provide methods for creating and destroying the GATT client handle, discovering, reading, and modifying attributes, and setting and releasing callbacks to be notified when characteristic values are changed at the remote device. Connect to a Bluetooth HID, such as a keyboard or mouse, using the Tizen.Network.Bluetooth.BluetoothHid class. The Tizen.Network.Bluetooth.BluetoothLeDevice class provides methods for managing the Bluetooth Low Energy (BLE) connections with other BLE devices and exchanging data between them. You can control the visibility of the BLE device, meaning whether its name appears to others searching for BLE devices. In addition, you can discover neighboring BLE devices through scanning. This process is asynchronous, so you must build and hold the list of devices in the neighborhood. You can use LE operations to manage scans, add advertising data, set the advertising connectable mode, set the advertising mode, and start and stop advertising. The Tizen.Network.Bluetooth.BluetoothAvrcp class provides methods for remotely controlling audio and video devices. Bluetooth AVRCP is used with the Advanced Audio Distribution Profile (A2DP). Through AVRCP, you can handle remote controls (such as PlayerState, EqualizerState, RepeatMode, ShuffleMode, and ScanMode). You can receive notifications of Bluetooth AVRCP events. Bluetooth use is based on profiles. Tizen Bluetooth features support the Audio, GATT, and HID profiles. Note You can test the Bluetooth functionality on a target device only. The emulator does not support this feature. The Tizen.Network.Bluetooth namespace does not contain methods for enabling or disabling Bluetooth directly. You must display the Bluetooth activation settings application to allow the user to toggle the Bluetooth state. Define a discovery state change event handler to manage the discovery process. The Result property contains the result of the Bluetooth discovery process as a value of the Tizen.Network.Bluetooth.BluetoothError enumeration. If discovery has been successful, the parameter value is BluetoothError.None. If the discovery failed to start due to an error, the parameter value is BluetoothError.TimedOut. When you start the discovery process, the event is triggered with the BluetoothDeviceDiscoveryState.Started state. Similarly, when you stop the discovery process, the event is triggered with the BluetoothDeviceDiscoveryState.Finished state. Each time a remote Bluetooth device is found, the event is triggered with the BluetoothDeviceDiscoveryState.Found state. The DeviceFound property contains the discovered Bluetooth device, as an instance of the Tizen.Network.Bluetooth.BluetoothDevice class. To stop the device discovery, call the BluetoothAdapter.StopDiscovery() method. To bond with a discovered remote device, use the CreateBond() method of the Tizen.Network.Bluetooth.BluetoothDevice class. To cancel bonding, call the CancelBonding() method. To get notified when the bonding process has finished, define a bond created event handler and register it for the BondCreated event of the Tizen.Network.Bluetooth.BluetoothDevice class. To query the list of previously bonded devices, use the GetBondedDevices() method of the Tizen.Network.Bluetooth.BluetoothAdapter class. The method lists all the bonded devices, and accessing the properties of each bonded device object gives more information (such as device name, MAC address, and service list) that you need to connect to the device. To remove a device from the bonded list, call the DestroyBond() method of the Tizen.Network.Bluetooth.BluetoothDevice class. Note A Bluetooth device must be in a discovery mode (visible) for other devices to find it and connect to it. If you want other devices to find your device, you must set the device to be visible. 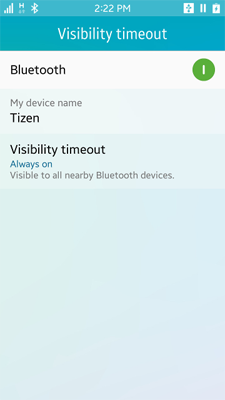 The Tizen.Network.Bluetooth namespace does not contain methods for changing the visibility. You must display the Bluetooth visibility setting application to allow the user to toggle the visibility state. To establish a connection with your device acting as a server, create an RFCOMM Bluetooth socket using the CreateServerSocket() method of the Tizen.Network.Bluetooth.BluetoothAdapter class, with the UUID of the service as a parameter. The UUID uniquely identifies which service to provide, and it must match with the UUID of the client's incoming connection in order to be accepted. The socket is created as an instance of the Tizen.Network.Bluetooth.BluetoothServerSocket class. To listen for an incoming connection from a client, call the Listen() method of the Tizen.Network.Bluetooth.BluetoothServerSocket class and define and register an event handler for the AcceptStateChanged event. When you no longer want to accept any other connections or provide a service, destroy the server socket with the DestroyServerSocket() method of the Tizen.Network.Bluetooth.BluetoothAdapter class. Define a socket connection state change event handler and register it for the ConnectionStateChanged event of the Tizen.Network.Bluetooth.IBluetoothClientSocket interface. The event triggers whenever the connection state changes (for example, when a client connects to a service on the server). The event handler receives the result of the connection state change as a value of the Tizen.Network.Bluetooth.BluetoothError enumeration, the new connection state as a value of the Tizen.Network.Bluetooth.BluetoothSocketState enumeration, and an instance of the Tizen.Network.Bluetooth.SocketConnection class that specifies connection details, including the client device MAC address. Note When you connect to a Bluetooth server device, retrieve the server socket file descriptor (the SocketFd property of the Tizen.Network.Bluetooth.SocketConnection class instance) in the callback and store it for later use. You need the file descriptor when sending data or disconnecting from the service. To request a connection to the Bluetooth server, first discover the server, and then create a socket using the CreateSocket() method of the Tizen.Network.Bluetooth.BluetoothDevice class, using the UUID of the RFCOMM-based service as a parameter. This UUID must match the UUID used by the server when it created the server socket using the CreateServerSocket() method of the Tizen.Network.Bluetooth.BluetoothAdapter class. To read data from other devices, you must define the data received event handler, which is invoked when your device receives data from other Bluetooth devices. Register the event handler for the DataReceived event of the Tizen.Network.Bluetooth.IBluetoothServerSocket interface. The received data is passed to the event handler as an instance of the Tizen.Network.Bluetooth.SocketData class, which contains the socket file descriptor, the size of the received data in bytes, and the data itself as a string. Before you can use the Bluetooth GATT functionalities, you must successfully connect to the BLE target. /// Wait for a value change notification from remote device. In the event handler method, handle the scan results. The parameters contain information on all the scanned LE devices, such as the device name, transmission level, service data list, appearance, and manufacturer data of the devices.